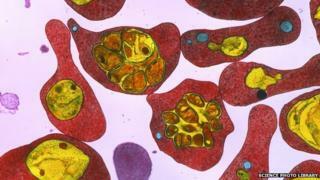 Warmer temperatures are causing malaria to spread to higher altitudes, a study suggests. Researchers have found that people living in the highlands of Africa and South America are at an increased risk of catching the mosquito-borne disease during hotter years. Prof Mercedes Pascual, from the University of Michigan in the US, who carried out the research, said: "The impact in terms of increasing the risk of exposure to disease is very large." Prof Pascual said: "The risk of the disease decreases with altitude and this is why historically people have settled in these higher regions." "This expansion could in a sense account for a substantial part of the increase of cases we have already observed in these areas," said Prof Pascual. In Ethiopia, where nearly half of the population live at an altitude of between 1,600m (5,250ft) and 2,400m, the scientists believe there could be many more cases. "We have estimated that, based on the distribution of malaria with altitude, a 1C rise in temperature could lead to an additional three million cases in under-15-year-olds per year," said Prof Pascual. According to the latest estimates from the World Health Organization, there were about 207 million cases of malaria in 2012 and an estimated 627,000 deaths. Most deaths occur among children living in Africa.